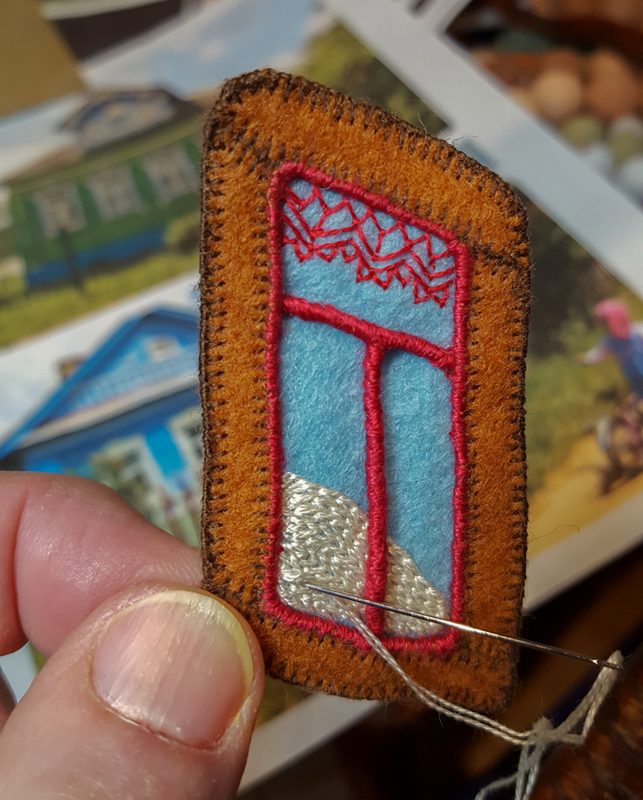 In this third and last post about the Russian scene in my upcoming picture book, I will show the process of making a traditional cottage or dacha, as well as a felt and wire tree. Previous posts feature other elements of this illustration. 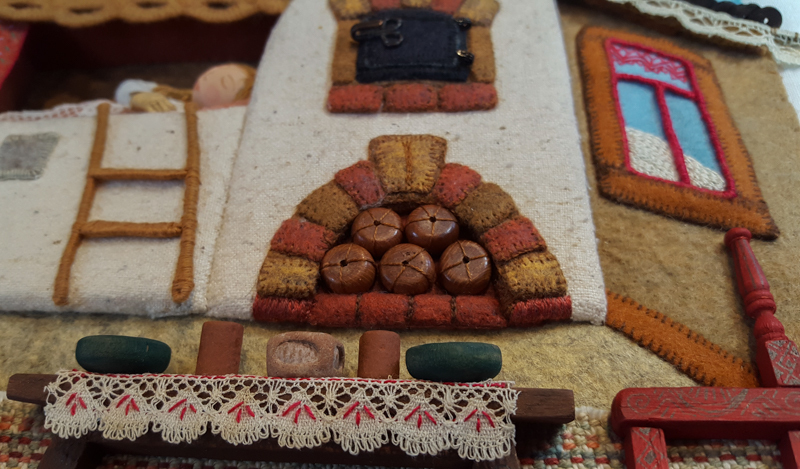 Part 1 : the larger house, including the roof and stove bed and Part 2 : the inside furnishings. My Bed will be a book about where children sleep around the world, with each spread depicting a different culture and living environment. The story is written by Rebecca Bond and will be published by Houghton Mifflin Harcourt in 2020. South America, Japan , India, North Africa and Afghanistan. To see a list of all my books, click here. 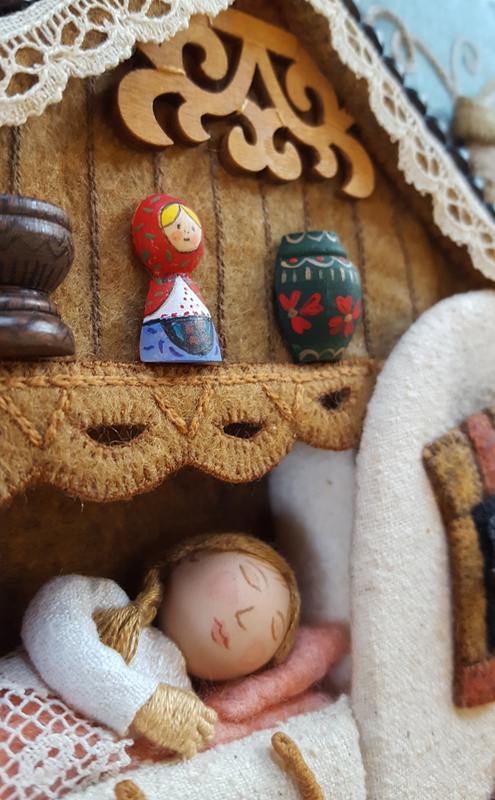 To get a clearer vision of Russian house styles, I researched dachas, which brought to mind Russian Folk Tales. 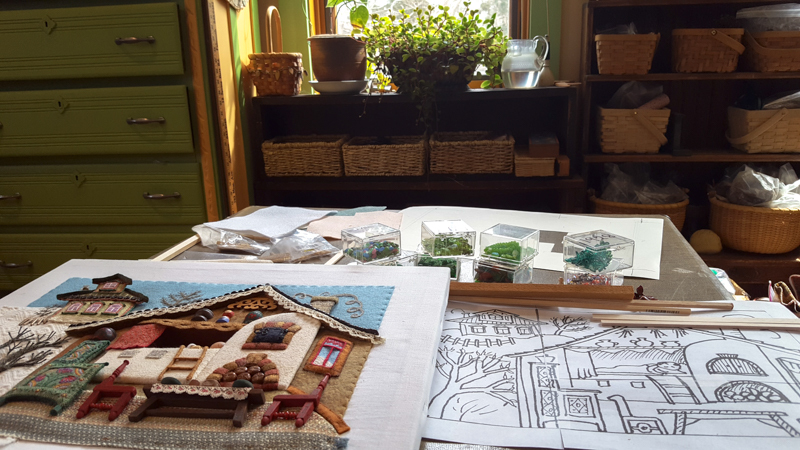 Their distinctive color combinations, ornate window fames and top-heavy overhanging roofs were fun to replicate. 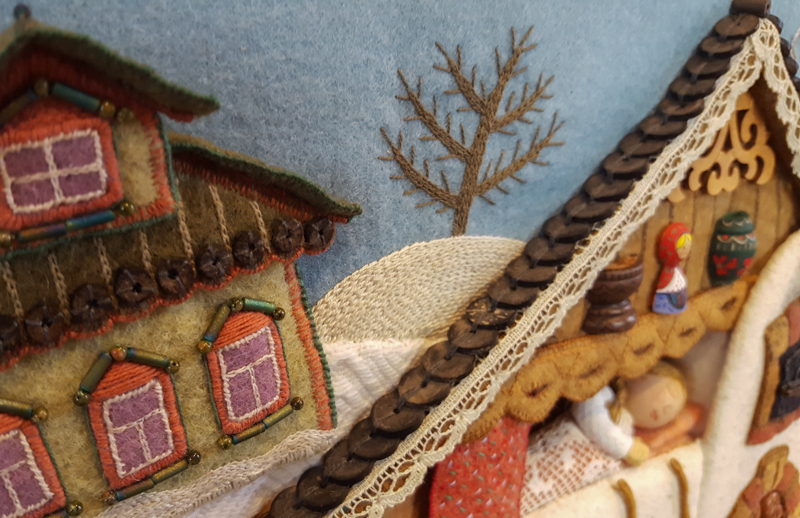 I added chain stitched snow-cover to the bottom. After finishing this inside window, I realized that it also also needed some snow. It was tricky working around the wire muntin bar in the center. 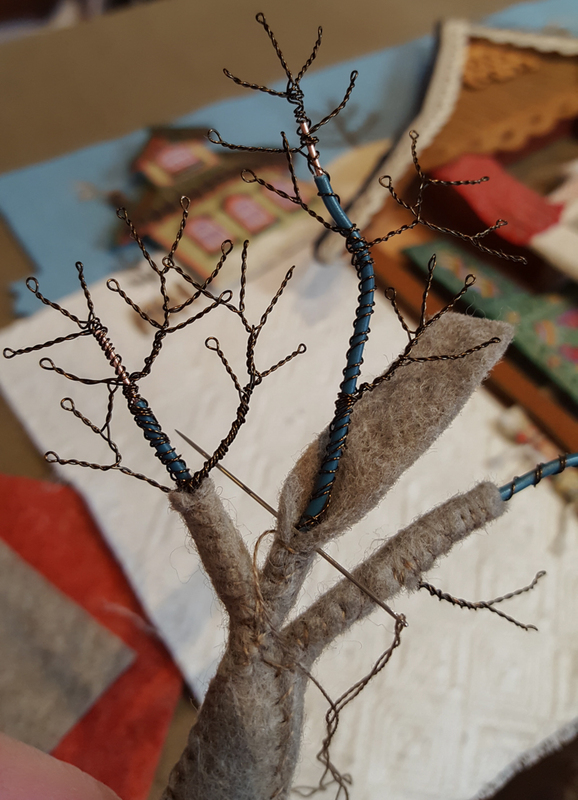 I formed the tree skeleton with wire of different gauges and covered the trunk and lower branches with felt. This shows the messy seams on the back. 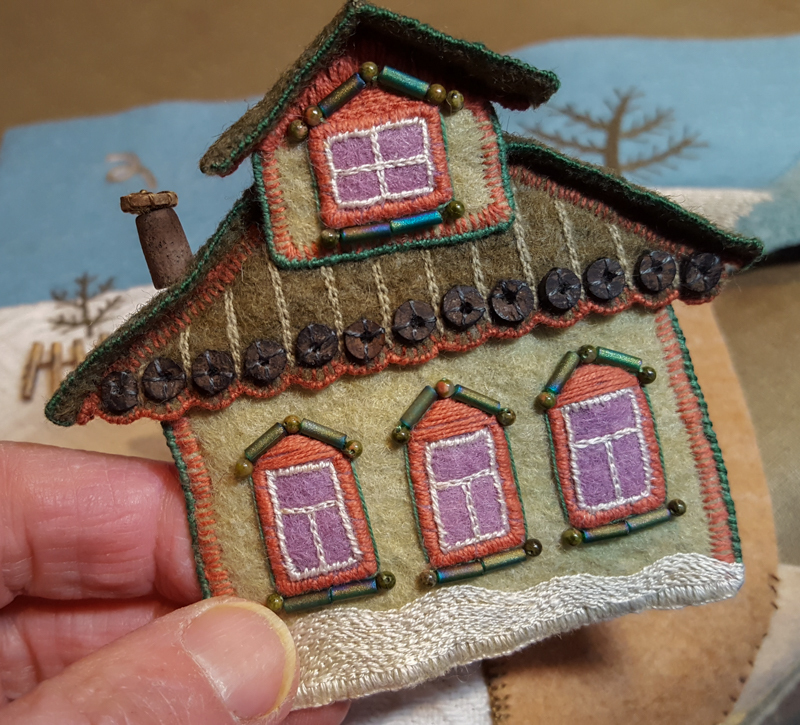 On the front, I embroidered a bark texture with fly stitches. 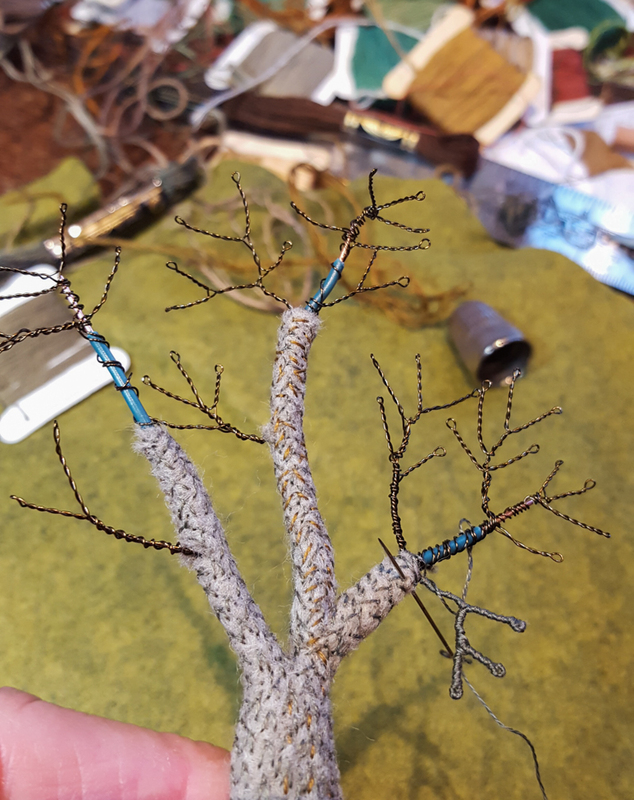 Then, I wrapped embroidery floss around the smaller wire branches. No matter how determined I am, it always seems to take about a month to complete an illustration of this size (9 in. x 14 in.). In this photo, you can see a mat board frame with a green wire stapled across the middle. I use it a a guide throughout the process, so that the size and proportions are correct. The wire marks where the gutter (or fold in the center) will be. 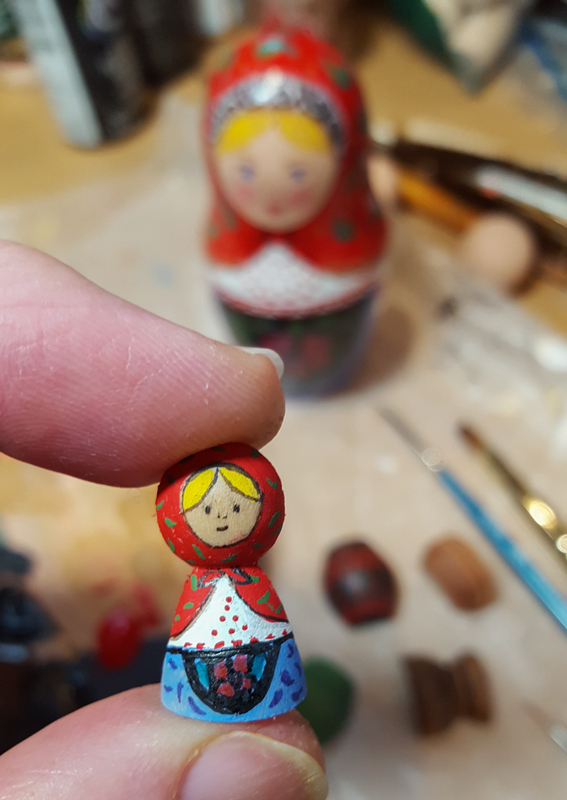 I painted a tiny wooden matryoshka doll that kind of matches a set I made and used as props in my animated film Liberty and Justice. 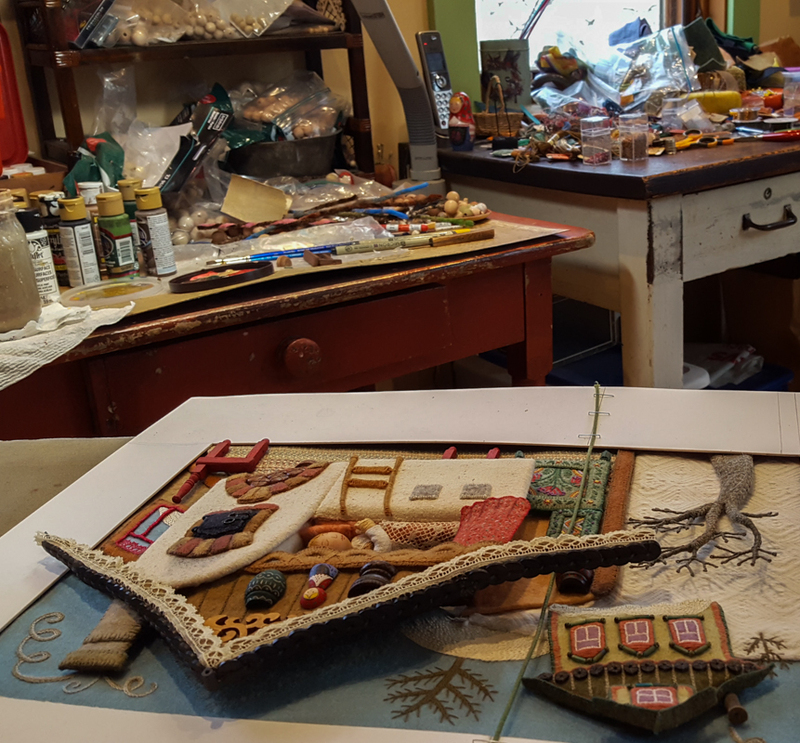 As with many components in my bas-relief illustrations, the doll and pots sitting on the shelf are made from purchased wooden parts, which I cut in half with a saw before painting them. 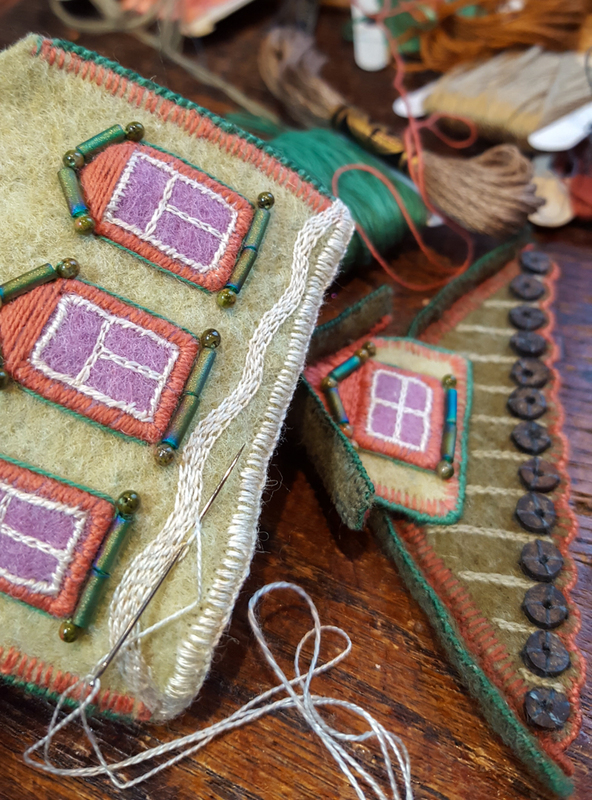 Instead of gluing them directly onto the background, I glue a small piece of felt to the back of each item and then sew that to the back fabric. Glue is so permanent and I want to be flexible up to the end and able to reposition them, if necessary. 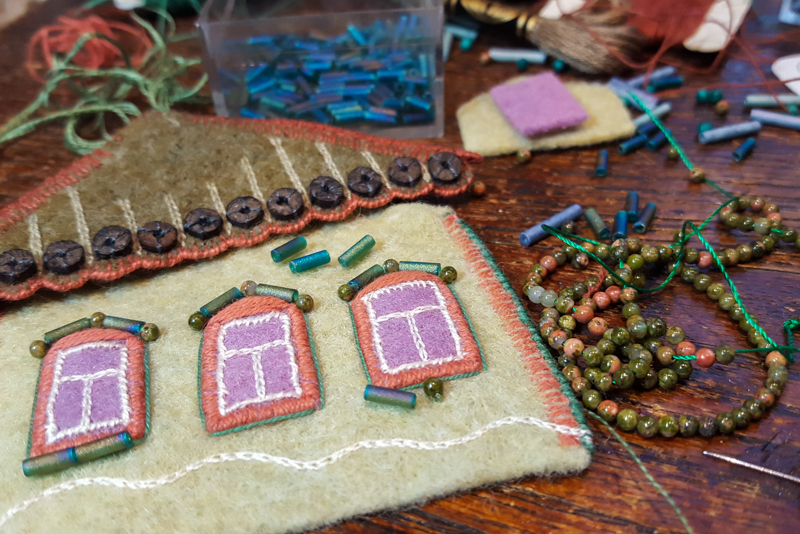 and decorating the felt curtain with diagonal slashes of thread. I hope that you enjoyed this tour behind the scenes. Previous posts feature other elements of this illustration. 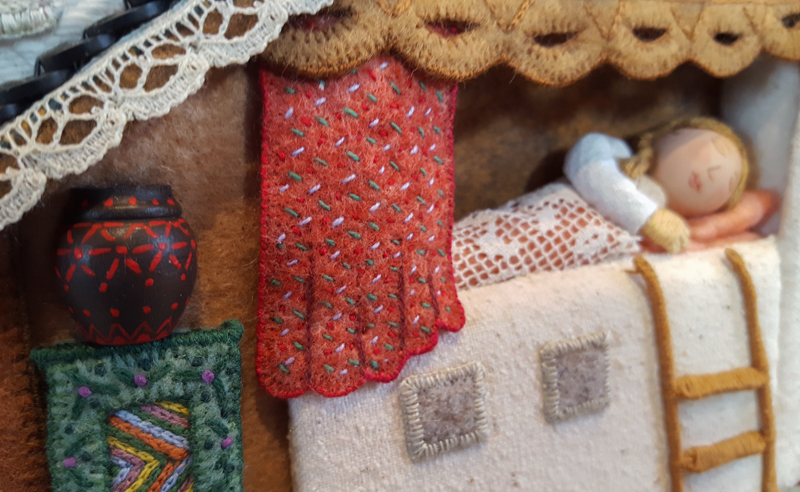 Part 1 : the larger house, including the roof and stove bed and Part 2 : the inside furnishings. I am Sooooo looking forward to holding this book in my hands! Thanks Amy, it is pure joy working on this book and I, too can’t wait ’til it’s out there in book form. Wonderful. Maybe this is the way I can comment. We adults will enjoy this book as much if not more than the children! Publication date seems so far away! 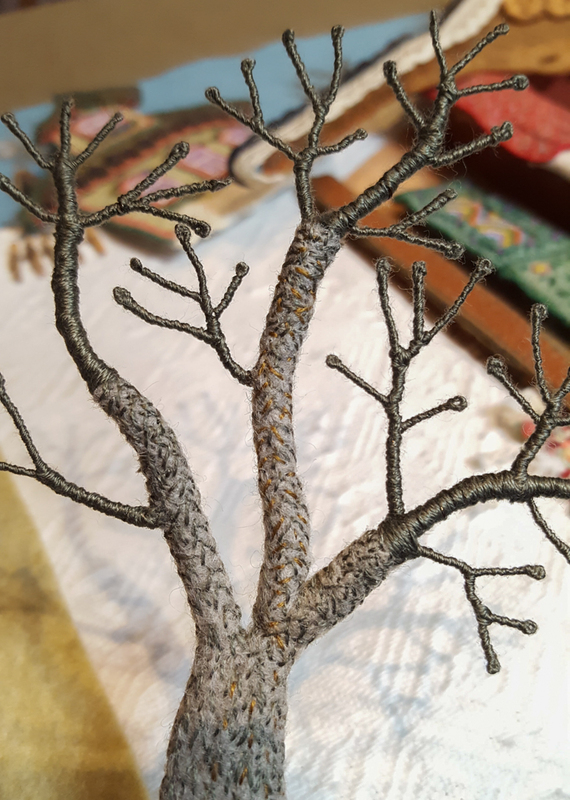 The technical detail you use to create these artistic masterpieces is something else! Thanks Nancy. The deadline of next winter will come too soon! Then, the publishing team has at least a year to design, print and promote the book. Picture books with good reproductions take a lot longer than books with just text. The way you capture childhood innocence in the sleeping faces of the children amazes me! Just beautiful, as always. I hope I can get a copy of the book to share with my grand-children. Such intricate and imaginative work. Beautiful. These are so wonderful! Thank you for sharing your process.